After a dramatic consultation period over the controversial Local Plan, the unexpected second phase kicked off yesterday, Wednesday. Following a relatively subdued response to the consultation period held at the start of the year, Rugby Borough Council suddenly found itself facing well-organised and highly articulate opposition when it went out to the public again in the autumn. 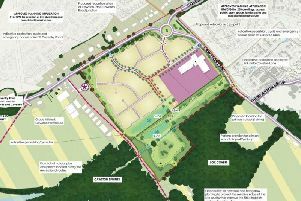 The proposals for that consultation, which finished on November 11, had one major difference – the inclusion of a garden village off the A45 towards Grandborough as a swap for housing previously allocated for a site at Walsgrave – but otherwise still included a scale of housebuilding which would change the borough forever. If there had been a lacklustre response before, there was a sudden awakening to the threat this time round. Campaign groups sprung up, working with the umbrella group About Turn and the objections flooded in. The scale of development – some 5,000 homes between Dunchurch and Bilton being another key element – created shock waves this time and concern a six-week period wasn’t long enough to make people aware and get them to respond. Both MPs and many others called for longer to object but resolutely the borough council said no until it ultimately said yes and declared a second period from November 30 to Wednesday, January 11. The details of the plan remain the same and the way to respond is set out in the Local Plan section of the borough council website.